Education Opens Doors is thrilled to share that Impact Manager Sandra Godina will attend and present at the National College Access Network Conference next week. Godina will co-present a workshop entitled “Can’t Stop Racism Without Talking About Race” with EOD Founding Executive Director Jayda Batchelder. 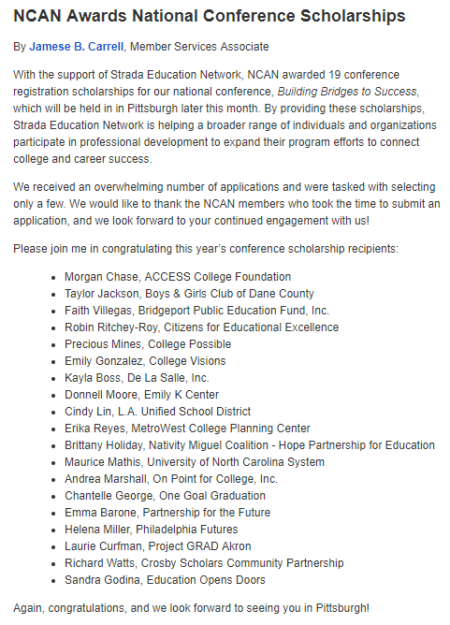 Congratulations to the other scholarship recipients for the 2018 NCAN conference, announced in the NCAN member newsletter. Are you planning to attend NCAN? Tweet @opening_thedoor and @SANDRA. We’d love to meet you!